How can it be the last Monday in the month already?? Unfortunately, the calendar is saying it's true. That means the Mojo Monday sketch challenge is a circle or square option and Julee has a great CAS layout that has so many possibilities! Since time is racing on by, I decided to add to my Christmas card pile by creating a snowy theme. I die cut some silver glitter snowflakes (SU) and layered them with Verve snowflakes stamped with Versamark ink and embossed with Pool Party EP. 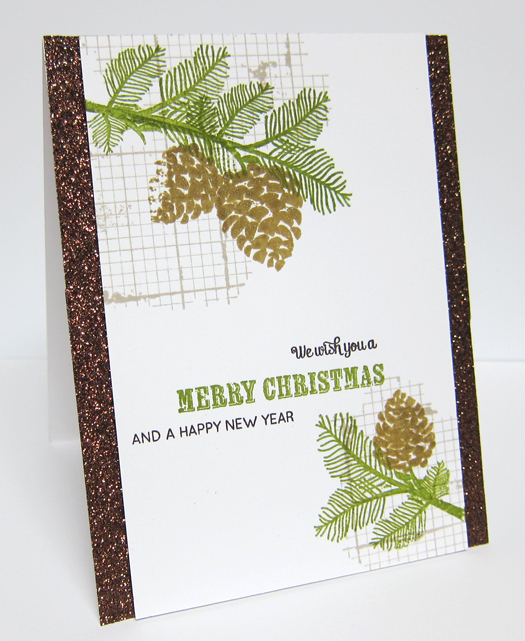 I then used Verve's Snowflake Tidings dies. The sentiment is a die by PTI and the banners are from MFT's Fishtail Flags Die-Namics. Don't forget to check out what the other mojomakers have created! You can stop by their blogs below...OR...you can hop over to the Mojo Monday blog and click on the beginning thumbnails. 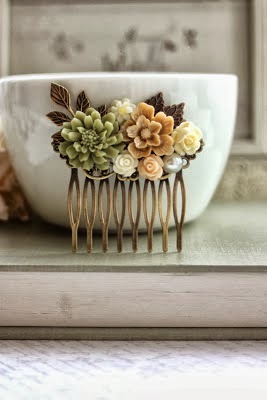 Be still my heart...the Tuesday Trigger photo has soft, earthy florals and copper tones going on! Just perfect for playing with some of my fave stampy stuff! The copper comb triggered my use of SU's Gorgeous Grunge set yet again (I know...you are getting tired of me using this set all the time - lol). I used copper embossing powder with the background images. 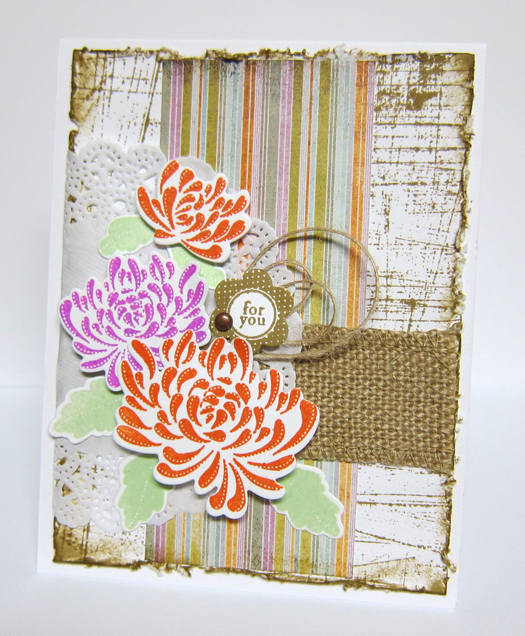 Then it was flower arranging time with W Plus 9 Fresh Cut Florals stamps. 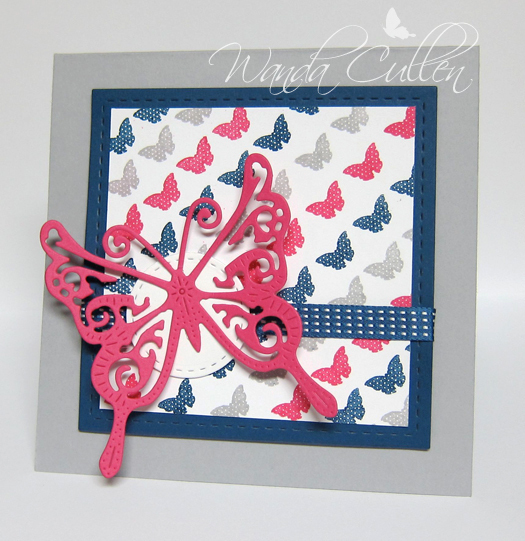 I die cut a large number of shapes, then stamped with many different shades of SU inks. I popped a couple of the flowers with foam tape and added a bit of shimmer with Wink of Stella's clear shimmer brush pen. My photo just doesn't capture the copper and the shimmer. :-( On SCS, today's Ways to Use It Challenge is to use squares, so this fits that theme as well. INK: Crisp Cantaloupe, Pistachio Pudding, Pear Pizzazz, Always Artichoke, Crushed Curry, Pumpkin Pie, Cajun Craze, Sahara Sand. cheesy Geico commercial makes me laugh every time! Sorry...I digress. When I saw Peggy's colors for SCS Color Challenge (Gumball Green, Smoky Slate and white), I let out a SQUEEE and thought it would work well with a new oak leaf stamp and die set by Tim Holtz. 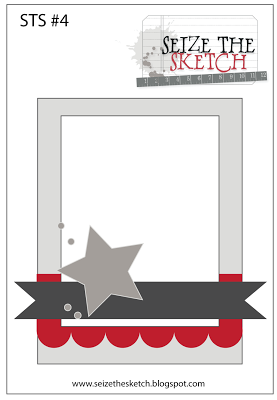 I am using Stacy's great layout for Seize the Sketch #4 - am wanting to use that one again and again! I really love the way you can layer up this leaf and can't wait to try a fall version! I stamped the leaf twice then die cut the left half and popped it with foam dots. I sponged with Smoky Slate ink and added the fine splat stamp (stamped off once) from none other than my go to set at the moment - Gorgeous Grunge by SU. 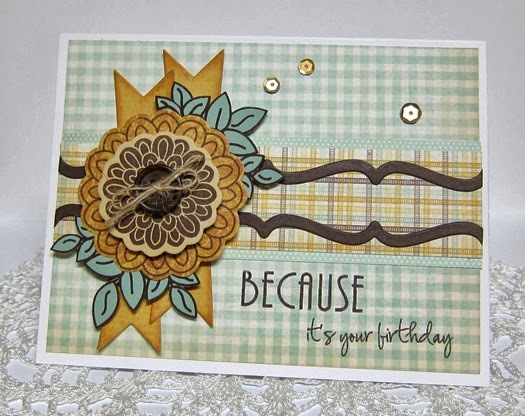 Love these tiny wood veneer stars by Studio Calico...fun to randomly add to a card! ACCESSORIES: Stitched Scallop border by Lil' Inker Designs, Wood veneer stars by Studio Calico. Hi everyone! 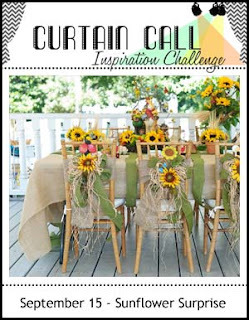 Vicki is hosting this week's Color Throwdown Challenge and she has chosen some happy colors! I immediately knew I wanted to use these Pebbles' papers and decided to pair it up with the Viva la Verve sketch challenge on SCS. 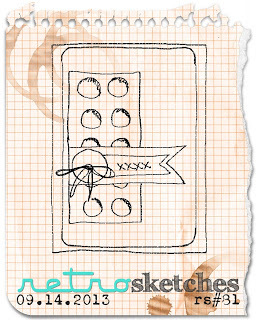 Check out this fun sketch by Charmaine! I recently acquired a freebie toy at stamp club - thanks to one of the gals purging her crafting space. It's a mini library pocket punch by McGill which is an ironic name for it as it's anything but mini! The punch itself is one huge punch (3 3/4" x 4 1/2"), but the punched result creates an adorable little pocket - perfect to have my little peep peeping out! I colored with Copics (Y13, Y15, Y17, B05, B04) then fussy cut, and added a rhinestone and some Wink of Stella clear glitter pen to the flower. Here's hoping you will join us... and remember - you don't have to have exact colors. Use something close and then link it up on the Color Throwdown blog using the linking tool at the bottom of the post. If you post to an online gallery, please use the keyword, CTD 261. For more inspiration, you'll want to check out the rest of the design team's wonderful creations! It's been great having Susan join us this month as a guest designer! This will be her last week with us, so be sure and stop by her blog and leave her some love! We are also sadly saying goodbye to Lynn as a design team member. She is needing more time freed up for other demands. ACCESSORIES: Classy Label Die (Verve), Scroll Die (Verve), Wood veneer stars by Studio Calico, Baker's twine, McGill mini library pocket punch. This was a fun and quick card for Sabrina's Technique Lover's Challenge to do traced doodling. I combined it with Harriet's CAS Challenge to use a sketch on this 3 1/2" x 6 1/4" sized card. I'm thinking the long card would be perfect to insert a check or money for a gift card! I created this bandana look by pulling out a really old, retired SU set - Polka Dots and Paisley. 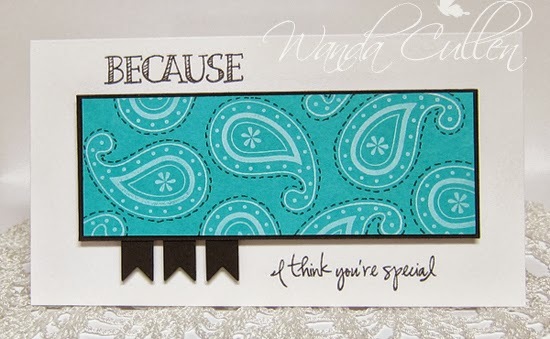 The sentiment is from Verve's Take Note set...such a fun set to make a gazillion different combinations of sentiments. I used Bermuda Bay (SU) cardstock and stamped with Memories Unicorn pigment ink - a great white ink that gives great coverage! Good Monday morning everyone! It's Mojo Monday Challenge time and you'll want to check out this great CAS layout by Julee! 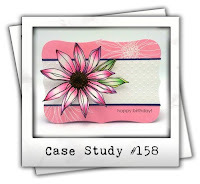 This was a fun one to layer up this gorgeous flower image from Verve's Surely Goodness set. I paper pieced the leaves after fussy cutting from Sage Shadow cardstock. I die cut four flags and sponged the edges with Tea Dye distress ink. Layers were popped with foam dots. You'll want to see what the other mojomakers have created, so be sure and stop by their blogs below...OR...you can hop over to the Mojo Monday blog and check out the beginning thumbnails. 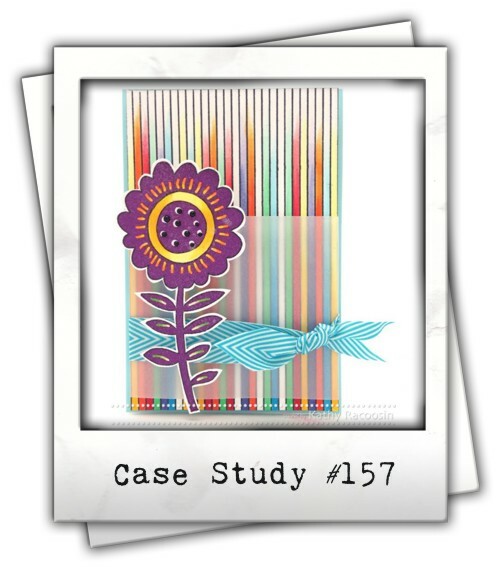 ACCESSORIES: Flag It Die Set (Verve), Goodness Flowers die set (Verve), Flourished Trim die (Verve). 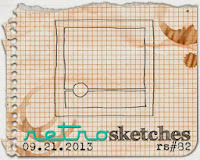 I'm celebrating the first day of fall that will officially be here tomorrow - September 22 - by creating this card for two different challenges...the Retrosketches Challenge and the CAS-ual Fridays Challenge - to use fall colors and at least one leaf. The finished size is 5 1/4" square. I had this leftover leaf from a previous project; it was sponged with Tangerine Tango, Cajun Craze and just a teeny touch of Chocolate Chip inks. I then pressed the leaf on a Versamark pad and then added clear embossing powder. This was repeated the second time to give a thicker, glossier look. STAMPS: Seasons of Change (leaf) by Sweet 'n Sassy Stamps, Gorgeous Grunge (background) by SU, Happy Fall (sentiment) by Verve. PAPER: Bermuda Bay, Smoky Slate, White. ACCESSORIES: Leaf die by Sweet 'n Sassy; Grosgrain ribbon by SU; Sequins by Avery Elle; Clear embossing powder; Foam dots. When I saw Stacy's Curtain Call Inspiration Challenge, I knew I wanted to use a fave Flourishes set for it! My card layout uses a sketch for the Cardabilities Challenge - a first for me to play along and I simply couldn't resist Karan Gerber's great card layout! 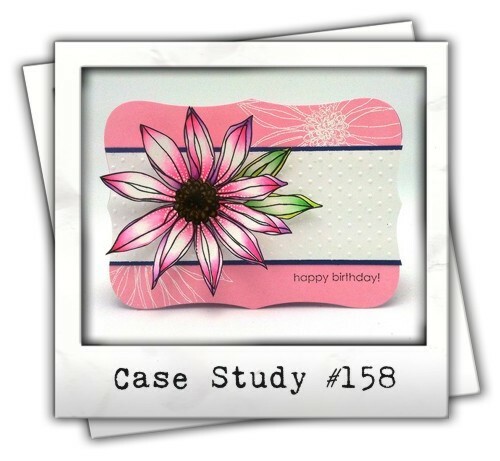 I was also inspired by the current CASE Study Challenge where Kathy Racoosin has a large fussy cut flower as the focal point and the same flower theme is stamped in the background. 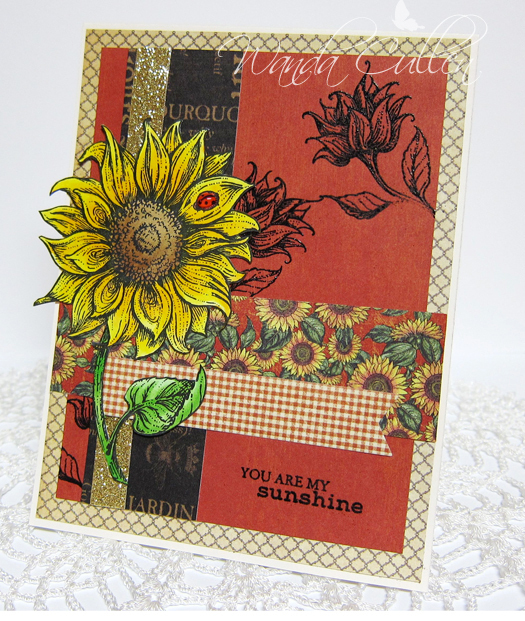 For my interpretation, I embossed the BG sunflowers using black EP so I could have that added sheen and texture. I thought the gold glitter tape strip also added a fun bit of sparkle and texture. PAPER: French Country 6x6 pad by Graphic45, Vintage Cream by PTI, X-Press It Blending Card (used for Copic coloring on large sunflower). INK: Versamark, Memento Tuxedo Black. ACCESSORIES: Gold glitter tape by American Crafts, Black EP, Fishtail Flags Die-Namics by MFT, Glossy Accents (added to ladybug). COPICS: Y02, Y06, Y08, Y17, YG11, YG13, YG17, R24, R27, E55, E57. 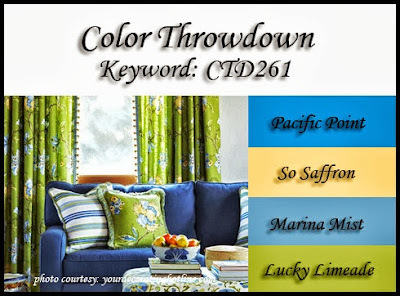 This is my second post today - scroll on down to see my Color Throwdown card. I wanted to play along with a fairly new (to me) challenge on the CAS(E) this Sketch blog. N@Ali has a wonderful layout that inspired me to ink up this PTI Peaceful Pinecones set as well as a new SU Off the Grid single stamp. I recently discovered glitter tape which is so quick and easy to add some pizzazz to a creation! I used a Wink of Stella clear shimmer brush to add some more sparkle to the pinecones. I'm thinking I will need to mass produce more of this design since I'm getting a slow start to my Christmas card stash. INK: Old Olive, Sahara Sand, Baked Brown Sugar, Chocolate Chip. 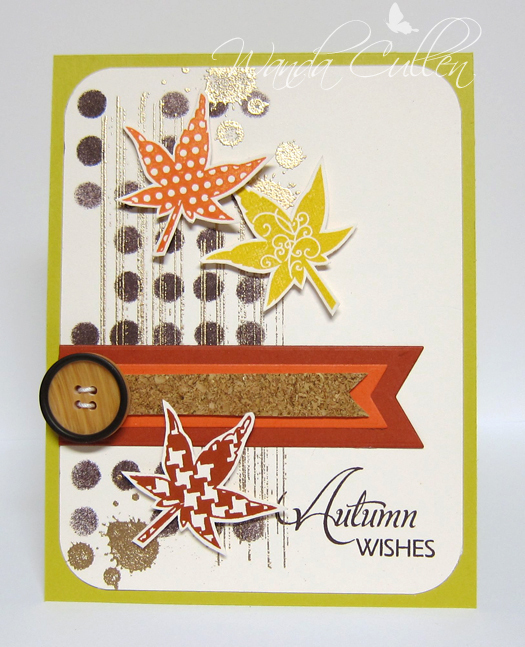 There's another Color Throwdown Challenge on board and Tammy has some awesome fall colors for us! They were perfect for me to FINALLY ink up these mum images from PTI! They have coordinating dies with this set, so no fussy cutting is needed. 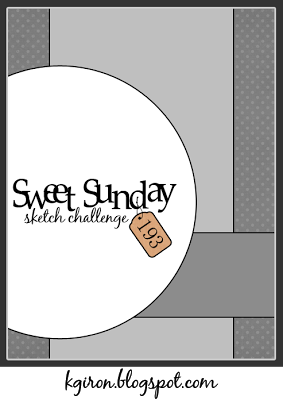 I'm using Karen Giron's sketch for her Sweet Sunday Sketch Challenge. edges. The SU jute ribbon literally just arrived on my doorstep right before I made this card and worked perfectly in the sketch design! What you can't really see in the photo is the touch of shimmer on the mums from using my Wink of Stella clear brush pen...love this new tool! Here's hoping you will join us... and remember - you don't have to have exact colors. 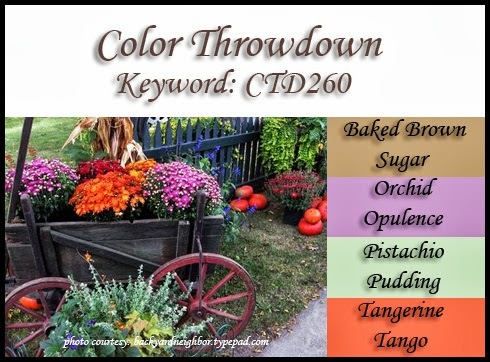 Use something close and then link it up on the Color Throwdown blog using the linking tool at the bottom of the post. 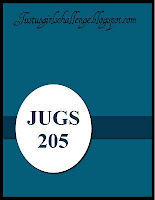 If you post to an online gallery, please use the keyword, CTD260. ACCESSORIES: Doily (SU), Jute twine, Jute ribbon (SU), Distessing tool, Tiny tags die and Mum's the Word dies by PTI, Copper brad. 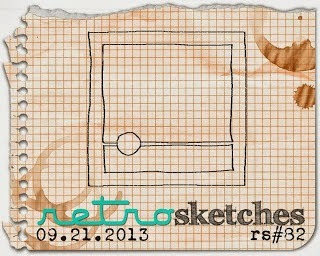 I'm playing along with the current Retro Sketches Challenge - another great layout that I couldn't resist! 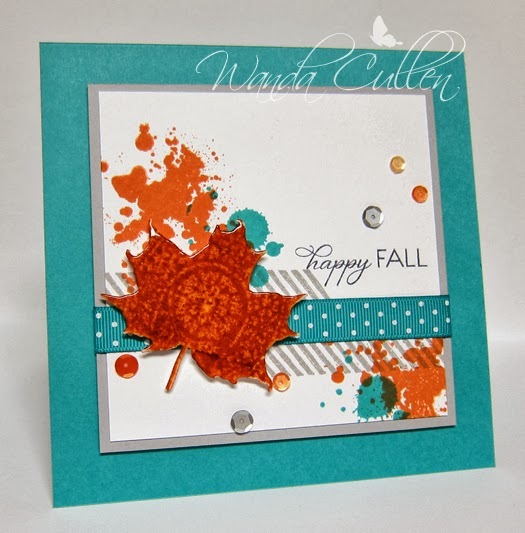 I'm using the fabulous fall colors chosen by Nancy on SCS for the Color Challenge: Chocolate Chip, Cajun Craze, Crushed Curry and Tangerine Tango with the dessert option to fussy cut or use a die cut. I first stenciled the dots using Dylusions' Dotted Flower stencil with Chocolate Chip ink. After it was dry, I gold embossed the splatter and fine line images from SU's Gorgeous Grunge set (I told you I couldn't quit using that set!). 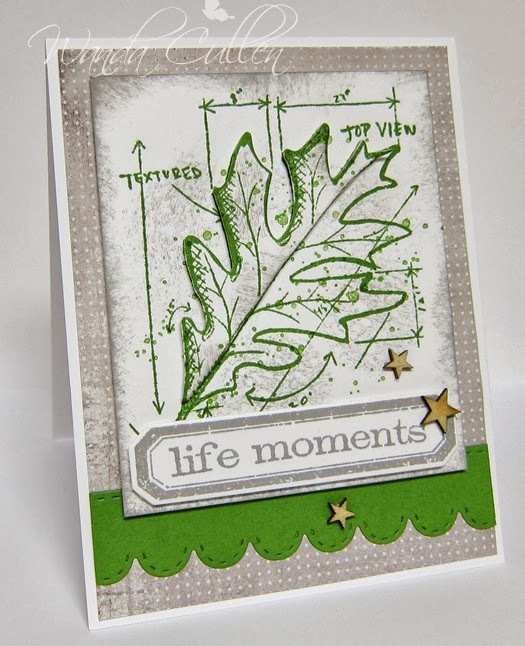 The leaves and sentiment are from Verve's Harvest Blessing set. The leaves were fussy cut and popped with foam dots. Good Monday morning everyone! It's hard to believe another week has flown by and it's time for another Mojo Monday Challenge! 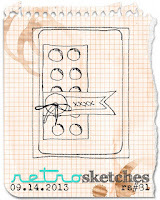 Julie has a great sketch for us - another horizontal one...unless you decide to flip it! This card is for the birds - lol - and one that I really wish I had time to do over. It didn't quite end up like I envisioned, but with having to work and having a long list of other "must do" things...a do over is out of the question. 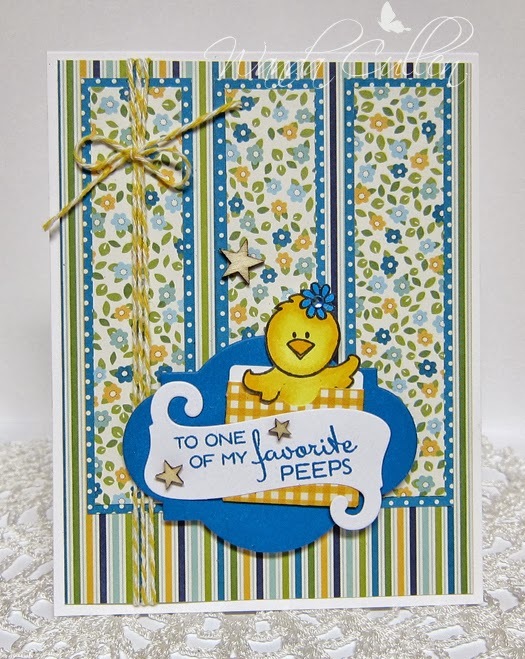 I had these patterned papers from Pink Paislee's Butterfly Garden Collection for quite some time and thought they blended in with the colors of the chipboard bird with bling (a charm by Recollections). The cork flag is a sticker by Little Yellow Bicycle. 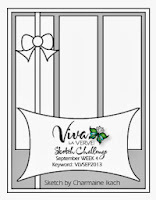 Seam binding is from Verve's Signature Ribbon Collection. 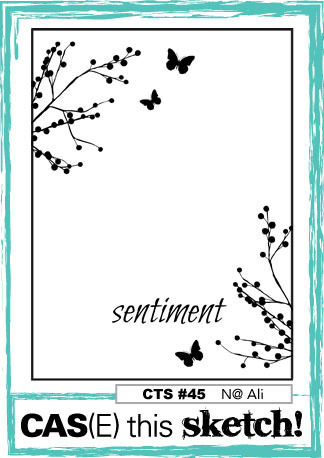 The sentiment panel is a stitched rectangle die by Lil' Inker Designs. 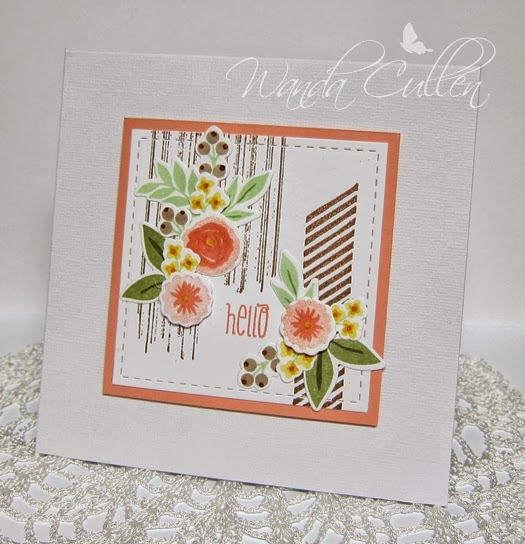 The sentiment is a Plain Jane stamp called Hope Perches by none other than Verve! 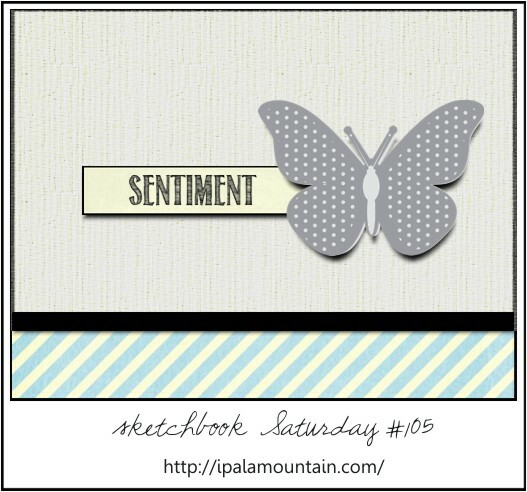 I'm thrilled to have been asked to be a guest designer for Chupa's Sketchbook Saturday challenge! 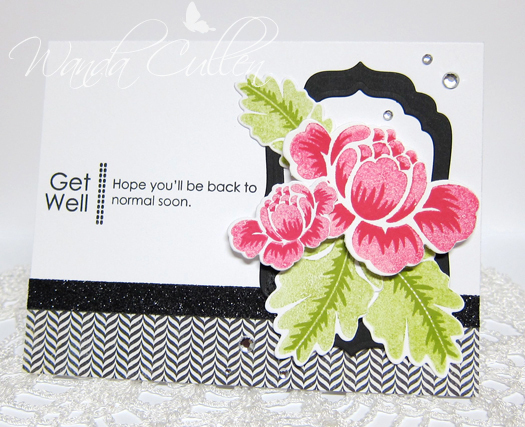 She's a master at creating "over the top" gorgeous cards and I've been a fan of her sketches for a long time! This one was so perfect to use a fun new purchase - glitter tape! Our DIL had major surgery this past Thursday and this was made to give to her. The designer paper strip is from Authentique's Renew Collection. I created a Labels Four frame and layered some two-step stamping flowers and leaves. For the first stamping step, I stamped the ink off once before stamping on the CS. A few rhinestones were the finishing touch! So, there you have it...a clean and simple get well card. Hope to see you playing along with this sketch! It has so many possibilities for interpretation! 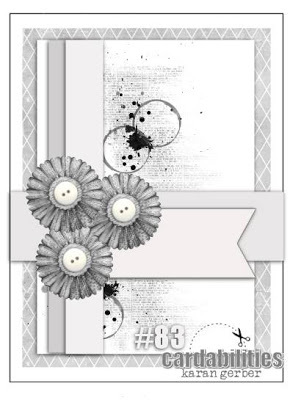 STAMPS: Rosie Posie (PTI), Rosie Posie Step 2 (PTI), Side by Side Sentiments (PTI). INK: Melon Mambo, Lucky Limeade, Versafine Onyx Black. ACCESSORIES: Rosie Posie dies (PTI), Rhinestones, Labels Four Nesties, Glitter tape by American Crafts. 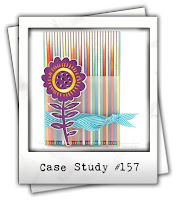 The Tuesday Trigger inspiration challenge photo and the CASE Study Challenge card by Kathy Racoosin both had very similar feels to them - gradient rainbow colors and vertical lines having prominence in the design! For that reason, I created one card for both challenges. I loved the overlapping colors happening in the "in transition" trigger photo, so I decided to overlap my arrows - stamping off once for some of them to give more of a gradient effect. I was also inspired by the trigger colors - warm orange and cool blues and greens equals happy in my book! 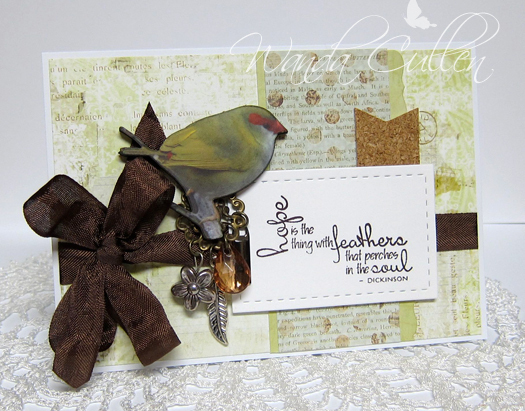 I used Kathy's vellum element in her card and added twine rather than ribbon. ACCESSORIES: Twine by PinkPaislee, Corner chomper. So glad you stopped by...always love your comments!